If you are someone who likes oceanic and spicy scents, then you may find John Varvatos Artisan Acqua to be an attractive fragrance. Released for the first time back in 2013, John Varvatos Artisan Acqua is perhaps a rather new perfume on the market, but, nevertheless, it has its own fans. The oceanic and aromatic scent is certainly an exotic one that will signify your presence. Even so, some people may find their connection with John Varvatos Artisan Acqua to be a love-hate relationship. Thus, we may say that John Varvatos Artisan Acqua is not for everyone. Are you the one that will make a match with John Varvatos Artisan Acqua? John Varvatos is an American contemporary designer of menswear who founded his own company in late 1999. Today, the brand of John Varvatos includes a variety of products, from eyewear, watches, belts, footwear, to fragrances. Music is one of the biggest contributing factors to John Varvatos’s style, and the designer credits his interest in the rock ‘n’ roll genre as the catalyst to his fashion works. Acqua is the fifth product in the Artisan line of perfumes by John Varvatos. The fragrance was designed and crafted by the perfumer Rodrigo Flores-Roux. John Varvatos Artisan Acqua is trying to project the confidence, creativity, and passion of a modern man. John Varvatos’s Greek roots may have played a role that evokes the fragrance’s Mediterranean characteristics. 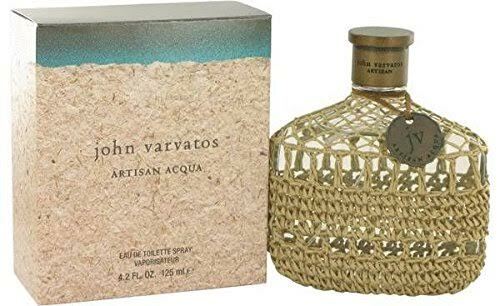 By combining an invigorating blend of citrusy ingredients, spices, and herbs, John Varvatos Artisan Acqua effortlessly delivers a unique oceanic aroma of the Mediterranean coasts. John Varvatos Artisan Acqua is unmistakably masculine. The design of the packaging and the bottle also comes with a Mediterranean atmosphere. The art on the box may remind you about a cape overlooking the sea, a view that is common around the coastal shores. Opening the box, you can find the bottle that is also equally unique and perhaps exotic. If you are familiar with movies about sea pirates, the bottle may have a thing in common with a pirate’s rum bottle. The bottle is actually clear and translucent, but is covered by an artistic mesh hand-knitted from light brown ropes. People who like to collect and display their perfume bottles will certainly find John Varvatos Artisan Acqua to be a cool collectible item. John Varvatos Artisan Acqua opens with spicy top notes. The top notes are constructed from a blend of spices and herbs, including pomelo, mastic, galbanum, and angelica root. There are also notes of mandarin orange that breathe some citrusy freshness. The middle notes are also quite similar, featuring palmarosa, toscanol, clary sage, and coriander, and are enhanced by the sweetness of lavender, geranium, and jasmine sambac. Fir resin, musk, and patchouli solidify the base. Overall, John Varvatos Artisan Acqua is a fresh oceanic and aromatic scent. It is light, making a good wear for summer and perhaps spring. The spicy scent is best used in daytime. You can consider it as a good choice for formal and professional occasions. A lot of people actually find it as a very good and pleasing scent. Some people may also find it lemony, salty, and savory. Unfortunately, though, John Varvatos Artisan Acqua is weak, hence the love-hate relationship. The sillage and projection are rather soft. After two hours, people need to be very close to you in order to smell the scent. Its longevity is also low; it starts to vanish after a few hours. This way, you may need to re-apply the perfume if you want it to last for a full day. Check the best price for John Varvatos Artisan Acqua here!